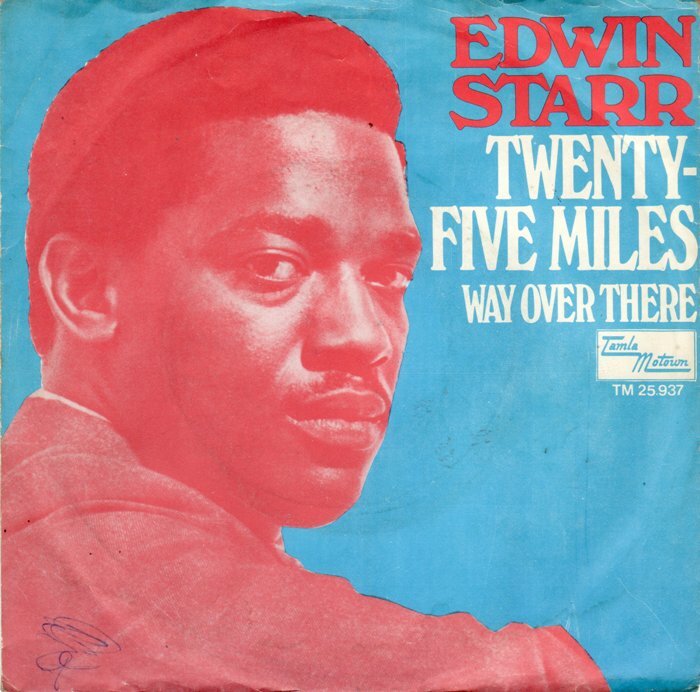 Edwin Starr‘s 25 Miles is a four-to-the-floor, solid gold soul belter, just over 3 minutes of pounding Funk Brothers rhythm and blast furnace brass that drives Starr’s phlegmy guttural grunts to the sweaty limits. Released in 1969 and re-released a couple of times since, it’s gained ‘classic’ status thanks in no small way to the northern soul scene where regular spinning has seen it become a talcum-dusted dancefloor filler. 25 Miles has had its fair share of cover versions. The Jackson 5 cut a version in 1969, all Motown-lite backing, call and response vocals and a fuzz guitar break that the other Edwin (with a ‘Y’) must’ve been subliminally channelling alongside Ernie Isley’s signature sound when he was recording A Girl Like You. The Jacksons’ version stayed in the Motown vaults until the mid 80s before appearing on a rare-ish Michael Jackson compilation, but if I want this blog to remain spinning happily forevermore in hyperspace, I’ll resist the urge to post it here. You can find it on the YouTube, if that’s yer thang. Cult American band White Denim have a track that’s currently being used to soundtrack the latest Nintendo gaming advert. Ha Ha Ha Ha (Yeah) was the lead single from their latest album, ‘Stiff‘, and if you listen carefully, you’ll spot more than a subtle nod to 25 Miles. 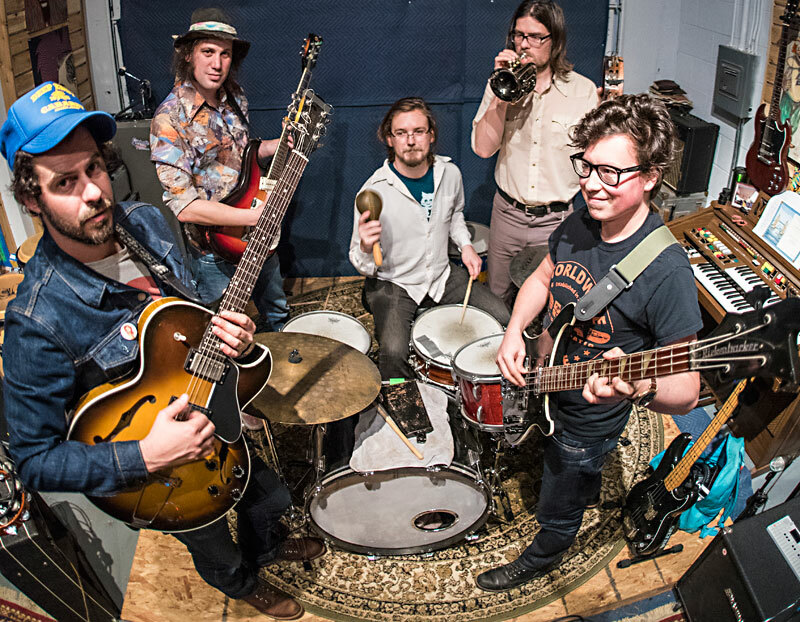 A band that defy pigeonholing, White Denim can be both proggy and punky and Pagey and Planty and sound terrific for it. Amazing musicians, they have a unique way of trimming their tracks of excess until it’s just the bare bones of guitar, bass and drums that are left…..but what a fantastic sound they make. Definitely on the ‘to see’ list, I’ll be keeping a keen eye on any upcoming tour announcements. But back to 25 Miles. By far the best version is the 2011 Skamla Motown (aye!) take by the mysterious Tenoshi. I’ve always thought that Tenoshi was an underground hip-to-the-jive Japanese mod/soul DJ, but it wouldn’t surprise me in the slightest if it turned out he/she was none other than someone like Paolo Hewitt or Eddie Piller (Rocksteady Eddie, anyone? ), moonlighting in spectacular fashion from their regular day job. My friend and yours, Google, has proven fairly elusive, so who knows? 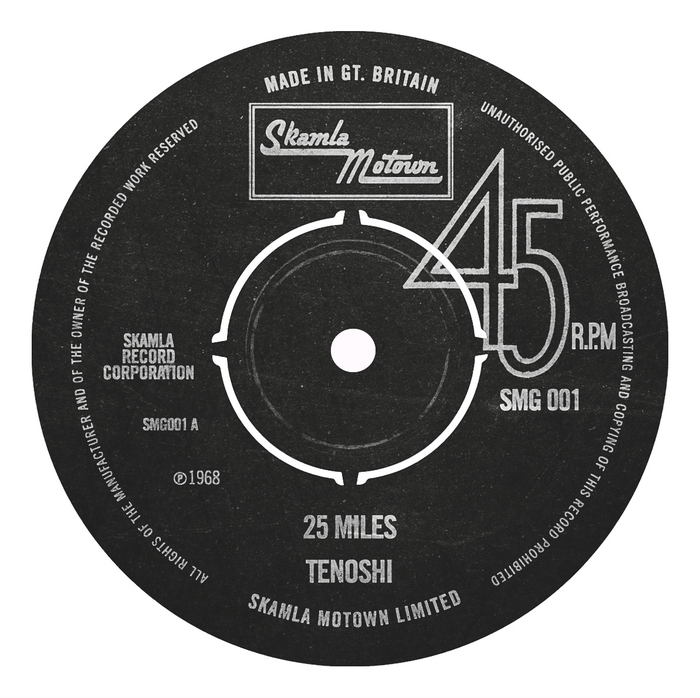 A scuffed-up, spliffed-up skanking take on the Motown original, this 25 Miles has been taken down to Studio 1 and given a rankin’ Rude Boy makeover. It rocks, which, if it’s playing as you read, you’ll just about have worked out for yourself by now. Anoraks will enjoy spotting the great wee nod to Prince Buster/The Specials with the horn motif at the end. If you’re lucky enough to own a 7″ of this (long-since deleted, it’ll set you back around £40 if it ever comes up for sale) you’ll also be aware of the lightly toasted remake of a Temptations’ classic on the flip side. Papa Was Rolling Stoned indeed. Worth seeking out, I tells ye.